Children like to question. And I appreciate it as an expression of their intense thirst for knowledge. I wrote this given-below dialogue in an easy, conversational style between two children and myself. This is, of course, based partly on an actual discussion with the named children, and later written for Dipika 2009. It is an annual spiritual magazine especially for children, regularly brought out by Sri Sarada Devi Ashram at Asherville in Durban. My grateful thanks go to Sister Pravrajika Ishtapranaji for according her kind consent to reproduce it here. After lunch, as usual, I was about to retire to my room and take my noon-day rest. Just then two fresh faced, enthusiastic, devoted boys came into my office, bursting with joy and questions. All thoughts of sleep left me when I sensed their willingness to have a conversation. An interesting discussion began when I asked the children to state the names of two famous incarnations of God. Rahul immediately mentioned the name of Lord Ram. His little brother Trishul remembered Lord Krishna. Trishul: Swamiji, why do Hindus believe that God incarnates on earth? Swamiji: That is a good question! God descends according to the needs of the time, to help us live happily, be peaceful and live spiritual lives. When people start misbehaving, fight with one another and adopt evil ways, then God comes to protect goodness. Rahul: But some of my friends ridicule us and say that we worship many Gods. Isn’t it true that there is only ONE God, Swamiji? Swamiji: Undoubtedly, God is ONE. Have you not heard that God is Omnipotent? Trishul: No! What does that mean? Swamiji: It means that God is all-powerful. Though there is only ONE God, yet by His divine power He can assume many forms and have many names. Therefore Hindus believe in different incarnations of God. The Sanskrit word for incarnation is Avataar. Rahul: So we see that God can take many names and forms because He is all-powerful! Swamiji: Exactly so, Rahul! You do know that there are many people on earth, though we are one as humanity, yet we have different tastes. We are born with our own varied natures. You may not like what I like. Therefore every one should have the freedom to choose the form of God that he or she likes. Each one worships the same God in the form that appeals to him or her, the most. But always remember, no matter what form of God you love and pray to, GOD IS ONE. Rahul: Why does God manifest Himself in human form? Swamiji: God wants to help us realise Him. He teaches us the righteous methods of living on His beautiful earth and how to care for all living beings. God loves all living and non-living beings on this earth, because everything has come out of Him alone. Trishul: Swamiji, but I find it difficult to think of God without a name and a form. Is not God with form more lovable? Swamiji: Rightly said, Trishul! God in his personal aspect can be loved and served too. You should be able to choose the particular name and form of God, according to your nature. Rahul: I love Lord Ram. He killed Ravana and brought righteousness back to Lanka. He ruled this earth from Ayodhya. Swamiji: Oh! that is wonderful. Can you name one great devotee of Lord Ram? Rahul: Yes Swamiji. 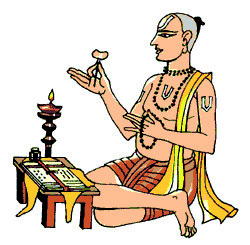 Tulsidas! My father and mother read a portion from Tulsidasji’s Ramayana everyday. They say that reading the Ramayana in the morning helps them to cope with the challenges of life. Swamiji: Excellent! 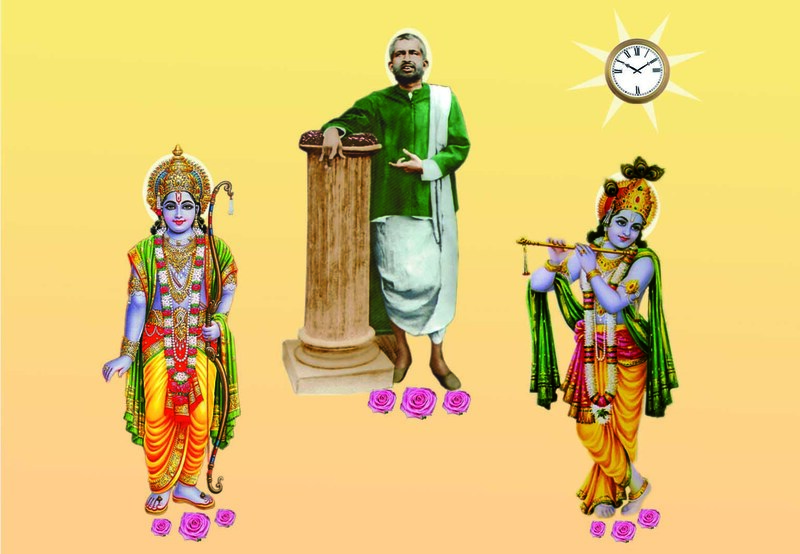 What is the title of the Ramayana that Tulsidasji wrote? Swamiji: Very good, Rahul. Now boys, let me narrate an interesting story about Tulsidas, the author of this great scripture. Tulsidas loved Sri Ram with all his heart. In the beginning, he did not prefer any other form of God for his personal worship. One day some of his friends decided to go to Brindavan, the playground of Lord Krishna. They requested Tulsidas to accompany them. But Tulsidas was a little hesitant, because he did not want to go to any place that was not connected with Lord Ram. Rahul: Was he a fanatic, Swamiji? Trishul: Which form did they take, Swamiji? Swamiji: When Tulsidas made pranams (prostrations) to the Lord, he assumed that the temple deity was Sri Krishna, so he was unwilling to open his eyes. But his friends asked him to observe the magnificent murti (image) of Sri Krishna, which was decorated so well. Tulsidas opened his eyes slowly and, lo and behold! he saw the lotus feet of His beloved Sri Ram. When he raised his head in wonder he could see the bow and arrows held in Ram’s long, beautiful hands. The Lord’s eyes looked like a freshly blossomed flower. He also saw the serene face of Mother Sita. Tulsidas was stunned and overwhelmed to see Sri Ram. He now realised that Lord Krishna and Lord Ram are ONE and the SAME divine being! Trishul: So Swamiji, does the word ‘deity’ mean ‘God in His personal aspect’? Swamiji: You have understood rightly, Trishul! There are many deities and you can choose any one from the hundreds of forms, according to your taste and temperament. The one that you choose is called the ‘ishta-devata’, meaning your chosen deity. By worshipping the ishta-devata, your mind becomes one-pointed and devotion to God grows very easily and quickly. In the beginning of one’s sadhana (spiritual practices), worshipping many deities dissipates one’s energy and may not be conducive to spiritual progress. Therefore our sages have recommended that we have an ishta-devata, a chosen deity. Rahul: Swamiji, which deity should I choose? Swamiji: Choose that deity whose form you like the most! Trishul: Is it not true that Hanumanji also has Sri Ram as his ishta-devata? Sri Hanumanji once explained that although there was no difference between the Lord of Lakshmi (Narayana) and the Lord of Janaki (Sri Ram), yet his chosen deity was the lotus-eyed Sri Ram. So, Rahul and Trishul! What did you understand? Rahul and Trishul: Swamiji, we understood that having a chosen deity is good for devotion but at the same time, we should not be narrow-minded. We should respect all deities because the ONE God alone has become many. Swamiji: You both attend Sunday Classes for children. Tell me, can you remember any example that our dear Master Sri Ramakrishna has quoted? Rahul: Yes, I remember! Master gave the example of a man digging a well. First he dug down to a depth of ten meters. He could not find any trace of water there. Then he selected another spot and dug a little deeper. He found no water there either. So he gave up that spot and dug in yet another place. Again he was unsuccessful. Disgusted at his failure to find water, he finally gave up his efforts. Trishul: Now, let me complete the story! So, Master said that if that man had patiently dug at one place, he would have found water. The same is the case with anyone who changes his faith continually. By having an ishta-devata one can progress and reach the goal. Swamiji: I really appreciate you, boys! How I wish all the children would attend our Sunday Classes! Brilliant indeed! and so much interest in our scriptures from such young minds. Remarkable!! Maharaji brings out the best in both young and old alike. We are so blessed to have regular posts from Maharaji and the regular interaction of devotees around the globe is truly wonderful and inspiring! It is true that Hindu young minds, especially those attending our Sunday schools are indeed brilliant in understanding the core teachings of our scriptures. They may not be able to rattle off the Sanskrit lines but they do possess the clarity of meaning. Once while I was in a parlour discussion with the devotees and children at PMB, one boy asked me if I could draw any parallel between Darwin’s theory of Evolution with our dashaavataar (Ten Incarnations) concept. I was really thrilled! A great article, Swamiji! Your blessings are needed. May Master’s grace be with you and Nandita. First time I saw your photos so kindly shown to me by Avitha. I am happy to hear about Nandita too. She must be a blessed one to have received diksha from Satguru Nirvananandaji Maharaj. I pray sincerely my the grace of the divine Mother you are well. This wonderful conversation proves once again the grace of god is constantly flowing. By his grace he decides everything. We constantly fear over matters like whether Hinduism will survive in our country when western ideals seems to be the flavour of the day. When young people speak with such understanding it is clear evidence of Masters grace. I am reminded of the incident of Swamiji at the neglected temple. He became so agitated. Mother explained to him to remove his fear as all happens by her will alone. Dear Maharaj, we have been reassured by Master’s appearence. There is a need to simply surrender to Him and He will take care of the rest. I only pray that your surrender may be complete. Be like the arrow that darts from the bow. Be like the hammer that falls on the anvil. Be like the sword that pierces its object. The arrow does not murmur if it misses the target. The hammer does not fret if it falls on a wrong place. And the sword does not lament if it is broken in the hands of its wielder. Yet there is a joy in being made, used and broken; and an equal joy in being finally set aside. May Master grace us with the spirit of surrender! The conversation with the youth clearly points out the purity of young children. I am delighted to hear the remark from both the children about narrow-mindedness and respecting all deities. May Lord Rama bless them with faith in the God. Ever since that conversation, every time I see yellow flowers, I am reminded that my ishta-devata loves me and will get “jealous” if I ignore my beloved bhagavan. Similiarly, Rahul and Trishul will remember this conversation every time they hear the words Ram. As a Disciple, I offer my pranam to My beloved Swami Premanandaji every time I see a yellow flower, for Swamji has reminded me that flowers are really deities on earth to mesmerise devotees of God. 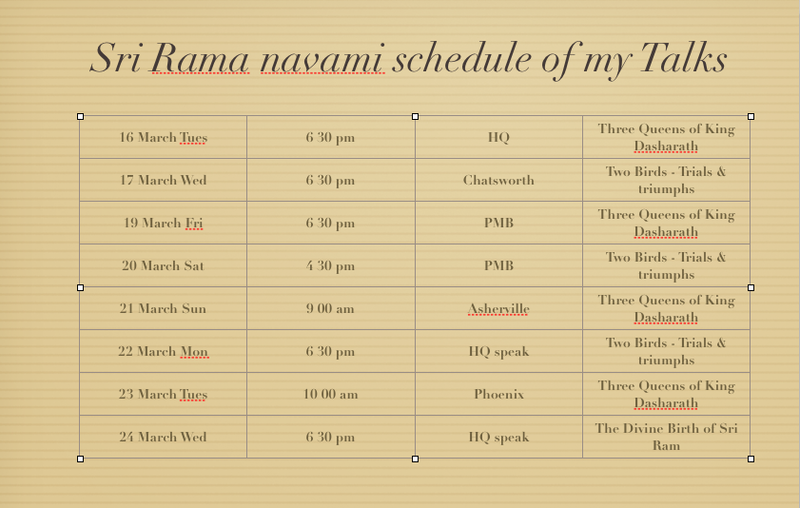 May Sri Ram bless Maharaj to continue with this blog! Thanks for your interesting personal experience! Please accept my humble pranam at your holy feet. This conversation is indeed great! Your blessings are needed to have such faith. May you grow in the faith in Lord! It is really good to see that children find interest in spiritual matters. They are the pillars of the future world. Hope by the grace of Thakur, Maa and Swamiji you are doing well. It was really nice reading this post. Kids usually ask so many questions and in cases, I have even seen elders push them away, asking them to keep quite etc.. Along with all the wonderful lessons the post has about devotion etc.., it teaches us a lesson to be patient and answer their questions too! We are followers of Ramakrishna Math [initiated by current President Swamiji] and it is nice to see a blog by a monk from the Order we so respect and live by. Welcome to this blog and am happy to know that you are one of our daughters! Yes, if the questioning young minds are silenced there will be no further progress. As elders we have a responsibility to not only try to answer the questions but also encourage the children in lateral thinking too. The imporatance of ‘Thought’ cannot be over emphasized. I remember Swamiji’s quote from his lecture on The Real Nature of Man, delivered in London: Here is a great tendency in modern times to talk too much of work and decry thought. Doing is very good, but that comes from thinking. Little manifestations of energy through the muscles are called work. But where there is no thought, there will be no work. Fill the brain, therefore, with high thoughts, highest ideals, place them day and night before you, and out of that will come great work. Talk not about impurity, but say that we are pure. May our Master be with you! I find such conversations very refreshing. That these children’s parents can read the Ramayan every morning is indeed a great way to start off the day, and an inspiration to many of us who find time as an excuse to avoid this uplifting mental and spiritual exercise. Thanks for visiting this blog and also for your encouraging words! Yes, one of the pitfalls while being earnest in spiritual life is the feeling of sanguineness that ‘more’ is not necessary where ‘less’ can do! Human mind can bring up any number of excuses for not performing the spiritual exercises. 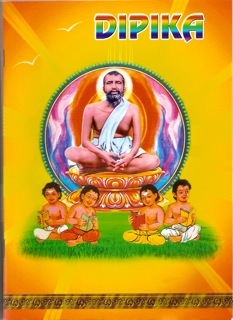 That is the reason why Swami Brahmanandaji, the ‘mental-son’ of Sri Ramakrishna would advise the devotees to keep up simple acts of spiritual exercises unhindered.